The object of 10’s or Better is to obtain a five-card poker hand that contains a winning combination. The better your hand, the bigger the payout (see the winnings table on the machine). You choose how many and which of your cards are to be replaced. You may replace your cards only once. Choose the value of the coins you wish to wager each round, by clicking on the + and – buttons on the left. Click Bet One or Bet Max to select the number of coins you wish to wager. Each click on the Bet One button increases your bet by the value of the coin you selected. Pressing Bet Max increases your bet to the maximum amount possible – that is five coins – and deals the cards automatically. You can also click the appropriate column on the winnings table to specify your bet size. If you do not obtain a winning combination, the round is over and you can start over. If you do, see the next section. If you choose a card that is lower than the dealer's, you lose your original winning. If the cards are equal, it is a tie, and you have the option to collect your original winnings (press Collect) or double again. If your card is higher, your win amount is doubled. You then have the option to collect your winnings or double even further. To calculate the winning amount for a card combination, multiply your bet by the number shown in the winnings table in first column from the left. 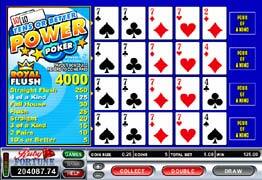 Tens or Better Power Poker is different from the standard Tens or Better video poker as you play four identical hands of cards. At the beginning of each game only the first hand is shown to you, while the other three hands remain face down. The game then progresses like a standard video poker. 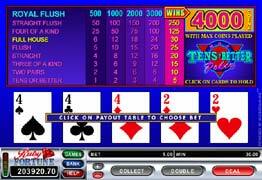 There are no wild cards and pays out a maximum of 4000 coins for a Royal flush, with five coins bet.